This discovery was submitted by Findmypast user Barbara McTygue Scanlon. The oldest Irish document that I have found on Findmypast is a Quaker marriage record for William Nevill and Elizabeth Pleadwell. They were married on 22 May 1702 in Mountmellick, County Laois. The Irish Quaker records contain exquisite detail, including a list of all the wedding guests! This record offers great family history information including William's parents' names, Henry & Mary Nevill and his birth place as Fostertown, County Dublin. William Nevill is buried in the Quaker Burial Ground in Rosenallis, County Laois. He died in March of 1752 and that record is also available on Findmypast. There is no headstone that I can find, I have walked the cemetery trying to. 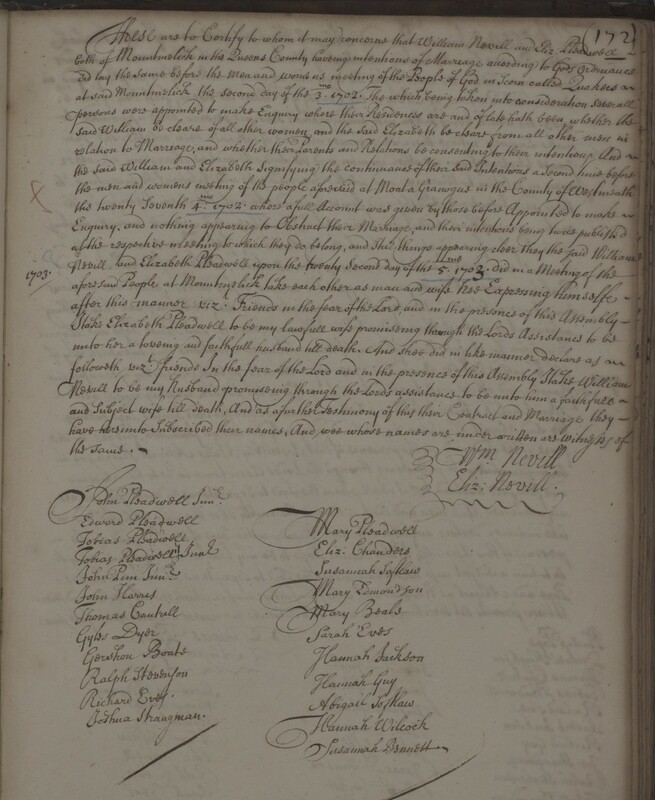 I also found a 1743 deed where William Nevill leased 20 crofts for his apprentices, he was a clothier. I have been able to trace his descendants through Findmypast too. According to oral tradition I learned from my family, William Nevill Jr. moved from Mountmellick to Tullamore around 1798. I found the family in the Lynally, Church of Ireland Census of 1802 - William Nevill & wife, Jane, Joseph, Abraham & William. Abe Neville married Margaret Molloy on 10 June 1840 in Rahan parish. They subsequently left for America in 1850. They are my great-great-grandparents. I also found reference to the lease of William Nevill in the Landed Estates Court Rentals 1850-1885 on Findmypast, taking my family story even further. Abraham & Henry Bewley's Landed Estate record - original lease dated 1743, John Bagot to William Neville for a lease of lives! The Quaker Library has restricted my family history research as it is only open from 11am to 1pm on Thursdays but now I can access these great records on Findmypast seven days a week! Send your discoveries to testimonials@findmypast.com We love hearing them.